Upper Creek Falls is usually considered to have an "upper" and a "lower" section. 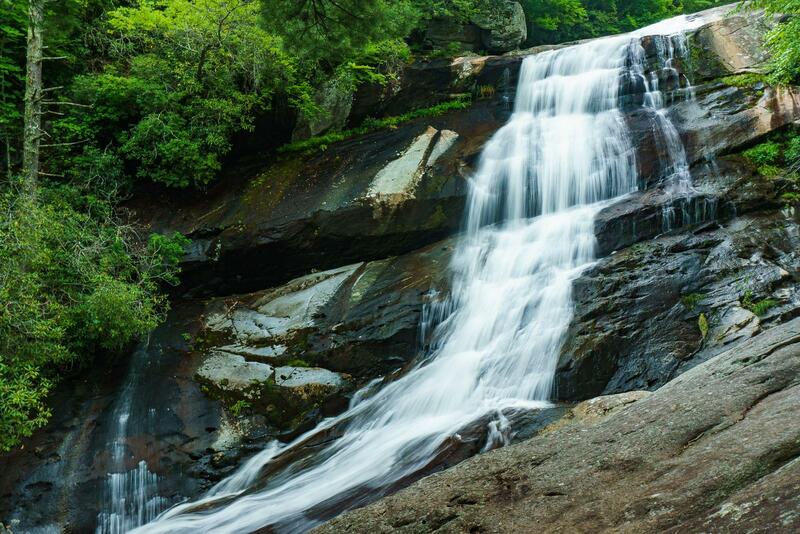 The main drop, or the "upper" Upper Creek Falls, is a steep, cascading slide with a signature curve in it near its bottom. The rocks are just steep enough to cause a few short free-fall sections as it drops over the ledges near the top. It then gathers in a chute and continues down to the lower cascades. 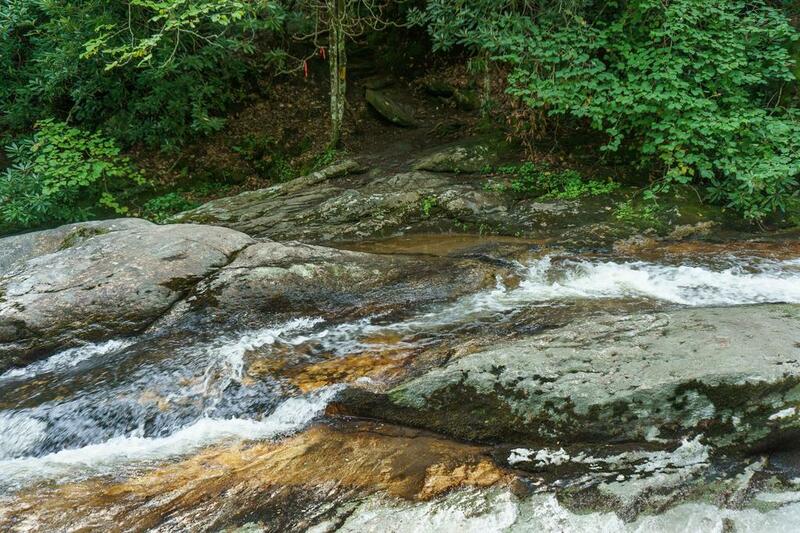 There are smaller cascades and slides both upstream and downstream from the main drop. The lower cascades - or "lower" Upper Creek Falls - are not as impressive, but still scenic as the water flows across the bedrock and through chutes and cracks. 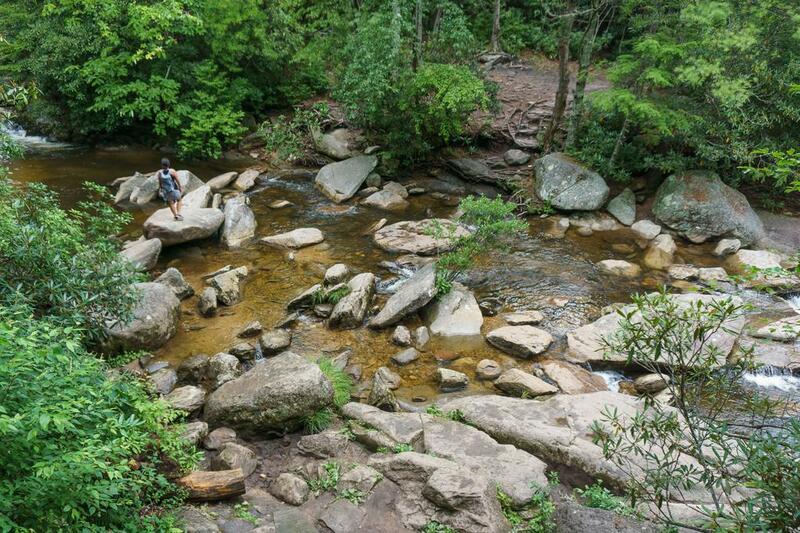 This is where many people choose to explore the bedrock area, slide, and swim in the pools during the warmer months. 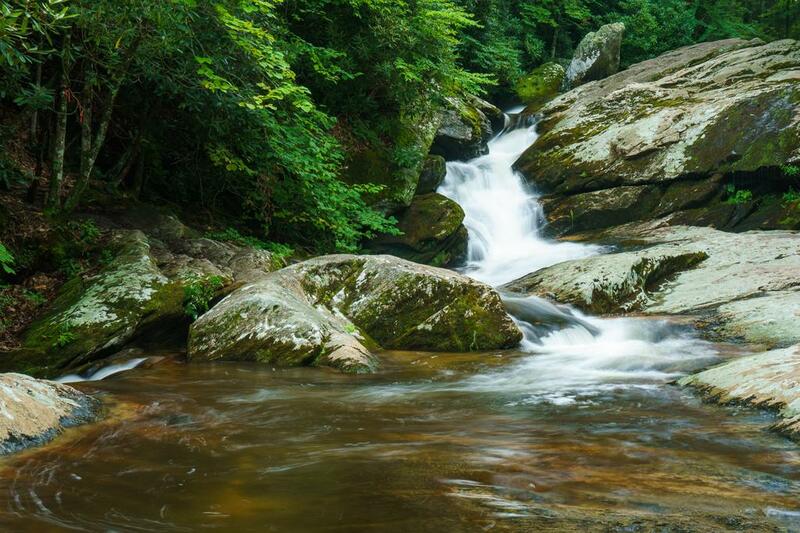 Since Upper Creek has a fairly big watershed area above the falls, it is a reliable or even high-flow stream, despite its elevation. From the junction of the Blue Ridge Parkway and NC Hwy 181 between Pineola and Jonas Ridge, drive 5.8 miles south on NC 181 to the signed parking area on the left. Or, from the junction of 64 Bypass and NC 181 in Morganton, it's 21.3 miles north on NC 181 to the signed parking area on the right. A short gravel drive leads to the parking area. 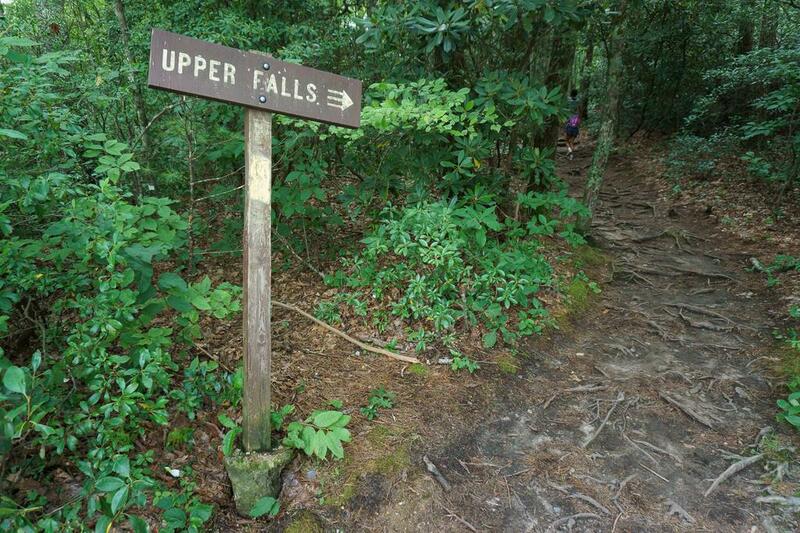 The Upper Creek Falls trail is a loop, so you can go either direction to reach the various parts of the falls. But since the quickest and easiest way to the best view of the main part of the falls is via the "Upper Falls" side of the loop, I'll describe it going that way. (People looking to swim usually just go directly down to the lower side). Sign for Upper Falls (on Upper Creek). The trail is very rooty, somewhat rocky, and eroded in places throughout. It receives extremely heavy usage, and that's having an impact on the trail quality. Though it was routed well, it just wasn't built for the amount of traffic it receives, and in places the tread is creeping all over the place as people pick their own path. Shortcutting switchbacks has become another problem, and severe erosion is the predictable result. Please don't shortcut the switchbacks! It's an easier hike if you just stay on the trail, and you won't be contributing to a potentially trail-closing problem for the Forest Service down the line. 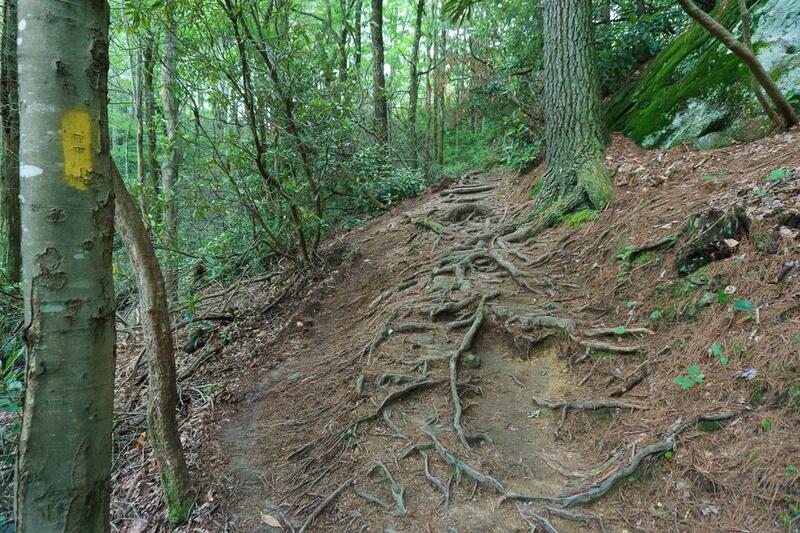 Trail creeping off the mountain due to a jumble of roots. The trail crosses the creek both above and below the falls. It can be tricky keeping your feet dry - especially at the lower crossing - and during high water, both crossings will be dangerous and impassible. Start the hike at the sign to the "Upper Falls" sign on the west side of the parking lot. The trail meanders below Hwy. 181 for a bit, and then begins descending through switchbacks near some big rock outcrops. You'll hear the waterfall below you. The trail drops somewhat steeply to a point above the upper drop. There is a big, wooden staircase at the end that assists your descent the last few feet to a rocky part of the creek just above the main drop. 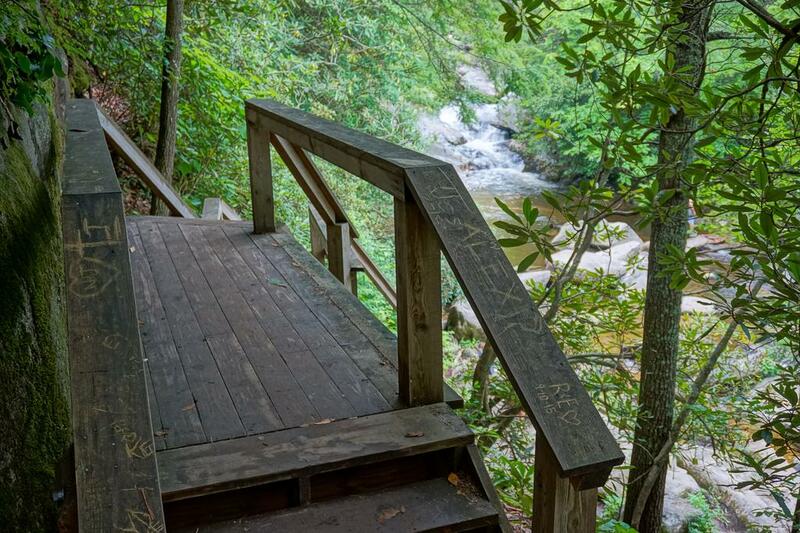 This wooden staircase drops you down to the upper crossing, above the upper falls. To your right, there is some open bedrock at the top of the falls. It's flat, and many people explore the view off the top of the falls from there. But it's a steep drop below - don't even think about exploring in that direction if the rocks are wet, and most certainly do not get in the water for any reason. Brink of the main drop. Upstream from the staircase is a big pool below a small cascade. Between the pool and the bedrock area at the top of the falls is an area of boulders you may be able to use to rockhop to keep your feet dry. But don't count on it, and if the water is too high - turn around! The lower crossing makes it harder than this one to stay dry. Also, the water can rise quickly in the event of heavy rainfall so use your best judgment here. The upper crossing area above the main drop. Trail continues across the creek in that campsite. The trail climbs up to a campsite on the other side of the creek, and then starts descending via some more switchbacks. 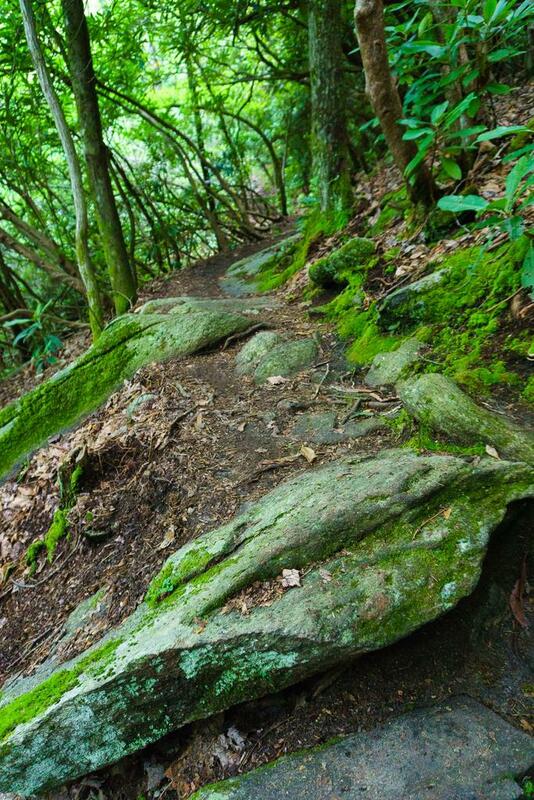 Side paths lead to the right toward the falls, but stay on the main trail to prevent erosion and avoid the unsafe areas right next to the falls. 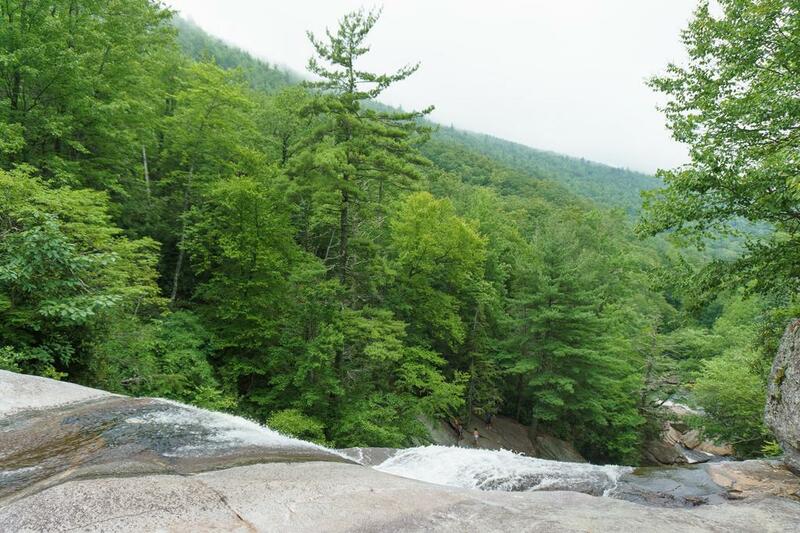 The trail comes out at a sloping overlook on a big rock next to the main drop of the waterfall. It's the best view, and it's reasonably flat in places so you can sit down and enjoy it. However, the exposed rock and roots will be slippery if it is wet, and there's still a good drop-off down below the overlook. Use caution. The trail continues downstream away from the overlook, and passes some of the smaller cascades located below it on the right. Don't try to access them from the trail, however, until the trail comes out onto the bedrock at the creek. The lower crossing. You will get wet on this ride! Look straight across to see the trail continuing on the other side. 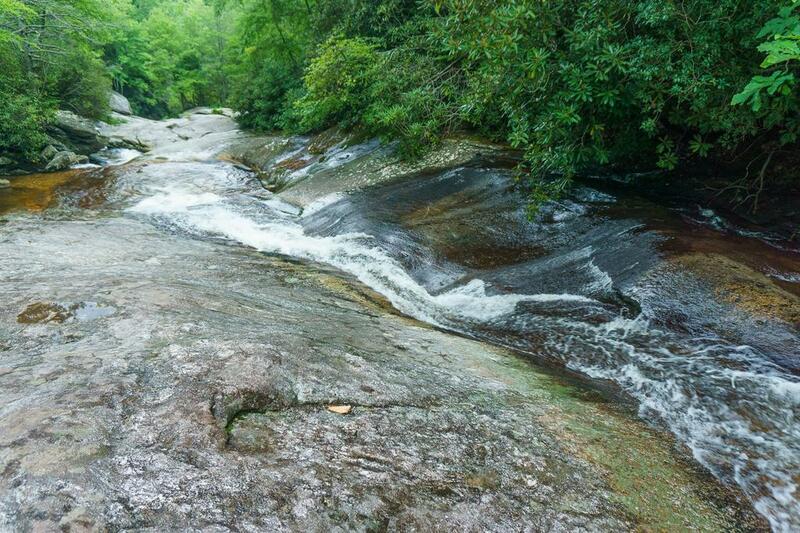 It crosses below a cascade and above an area of smaller chutes and cascades. You can explore upstream and downstream on the bedrock if it's dry, but as always, use extreme caution. A cascade on Upper Creek, below the lower trail crossing, used as a water slide and swimming hole in the warmer months. When you're done exploring, return to the trail, cross the creek, and head uphill on the "lower" segment. You'll pass a neat rock cave, and then there are nearly a dozen switchbacks and a 500 ft. climb back up to the parking area through a forest filled with rhododendron. Don't shortcut the switchbacks!